Year after year Educate Together opens schools in temporary accommodation, leading to uncertainty for these new school communities. 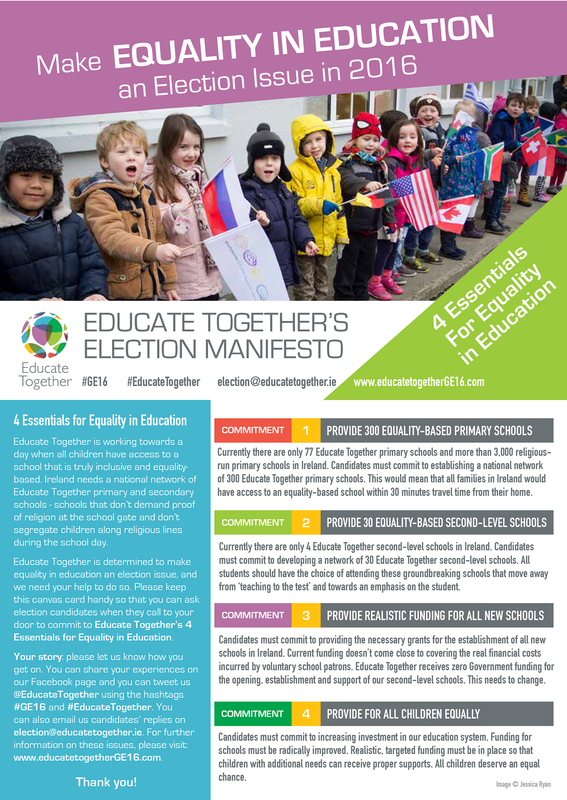 Whilst Educate Together is enthusiastic to assist the Government’s objective to provide 400 ‘non-denominational / multi-denominational schools’ by 2030, it is difficult to see how this can be achieved unless the constraints on accommodation for new schools are addressed. Make the provision of permanent buildings for schools a condition of the granting of planning permission for new housing estates so that schools are ready when families move in. Secure the permanent location of a new school as soon as it is decided that one is needed. Start the ‘patronage determination processes’ for new schools only once there is certainty on the location of the school. While difficulties regarding accommodation certainly exist, we will continue to work closely with the DES and other stakeholders to ensure new schools open in a manner which is as positive and efficient as possible. Educate Together hopes that opening new schools in permanent accommodation will become the norm in the future. Six new Educate Together schools open their doors this week https://t.co/clcTv74Keo #edchatie None of the schools will open in their permanent accommodation.